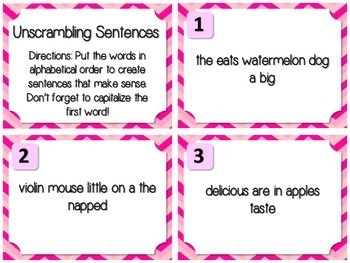 "Unscrambling sentences" task cards can be used so many different ways: as a center, for early finishers, scoot game, etc! 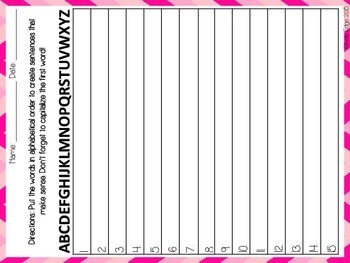 Students will put words in alphabetical order to create sentences. Some sentences make sense either way, so you will be able to check if students are really using alphabetical order! Great practice for using guide words in the dictionary. 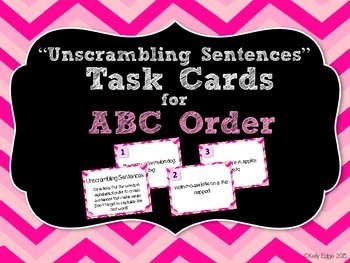 This pack contains 31 task cards with ABC order practice up to the third letter.